As a painfully shy child, books were the lifeline that I clung to. I acquired library memberships at four different libraries in Colombo and instead of integrating books into my life, rearranged my life around books. I would read in three-wheelers, furtively prop up fiction between the pages of textbooks in school and read by candle light during power-cuts. Armed with a seemingly unlimited appetite and limited pocket money, libraries soon became a sanctuary. Writer Caitlin Moran referred to libraries as “a cross between an emergency exit, a life-raft and a festival. They are cathedrals of the mind; hospitals of the soul; theme parks of the imagination. On a cold, rainy island, they are the only sheltered public spaces where you are not a consumer, but a citizen instead.”Good public spaces help humanize cities and libraries are a vital vein in a city’s lifeline. This Sunday, we explore some of Colombo’s libraries. After the walls of certain buildings were knocked down as part of Colombo’s beautification project, the grounds of the Public Library now dissolve into Viharamahadevi Park. In the mornings, joggers saunter in to skim through the morning papers. Visitors to the Public Library are greeted by an outsized wooden sculpture, which contrasts starkly with its light pink walls. The adult section has an extensive but mixed collection of books and a quick peek shows us a glimpse of what’s popular among readers these days. When acquiring new Sinhala fiction, the library is careful to get at least seven copies of each book, such is the demand. In the English section, the spines of the classics are stiff and tinged with the slightest hint of dust. Stephanie Myers’ ‘Twilight’ has the battered look of a book much read while George Eliot’s ‘Middlemarch’ sits across with all the disapproval that a Victorian classic can muster. Librarian Varuni Gangabadaarachchi explains that the Public Library began 90 years ago in 1925. It also houses a children’s section, special reference section filled with personal book collections donated to the library (sci-fi fans can browse Arthur C. Clarke’s personal collection, for instance), Acts of Sri Lanka, classical Greek books and delicate palm leaf manuscripts. There is also a Korean section maintained by the Korean Centre. The Public Library encompasses three floors and is also equipped with an auditorium, exhibition hall and study hall. For a nominal fee anyone can bring their own books and spend the day in the study hall behind the library if they wish (the hall is segregated according to gender as per anxious parents’ requests, explains Varuni). The lack of a physical boundary outside is not without its challenges as it has paved the path for acts of vandalism – outsiders freely avail themselves of the library’s canteen and bathroom facilities with little regard for resources. The library also reaches out to the less privileged by dispatching mobile libraries through certain areas of Colombo. Keith Davies, Country Director of the British Council in Sri Lanka has interesting plans for the future. “The main thrust is to bring the library up to date in the 20th century and to break new ground with libraries,” says Keith. With information readily available on the internet, the role of libraries has also changed in order to remain relevant. Libraries have taken on the mantle of community centres and multi-purpose meeting spaces. While in some regions, the British Council has been closing libraries because of declining member usage, in the South Asian region it is still (and hopefully will continue to be) a thriving space with heavy usage. Following best practices in the UK, the British Council located at Alfred House Avenue, Colombo 3 has started to experiment in taking the library beyond conventional spaces and in becoming a cultural convening space both in Sri Lanka and across the region. “We find that in Colombo and many other cities, there are not very many spaces where people can come and gather and read or talk and chat and so this is going to be one of them. We’re using the library space for things other than borrowing books,” explains Keith. Bookcases are wheeled into a corner to make space for seating areas, and talks and gatherings are frequently held in the library after work hours. Theatre groups have also stepped in to make inventive use of the space. A recent play saw an actor straddled atop a book case that was used as a war plane –while his fellow actors wheeled him around the library. While the new premises lacks the sprawling space and the reading nooks of its old avatar it has a strong literary fiction and non-fiction collection and extensive English language learning facilities. Filled with light, it is a pleasant space for lazy Saturday morning reading. Manager of the British Council Library, Shiroma Benaragama explains that they have a 20,000 strong membership and some 60,000 books. With improved technology, members now have the option of self-check in and renewing their books online. The library is also expanding its digital offerings and currently has 80,000 eBooks covering all subjects as well as nearly 14,000 e-journals. Access to English language teaching resources and facilities and its digital resources are some of its core strengths. Public Diplomacy Associate at the American Center, Sunera Schaller and librarian of the American Center Library Padma Bandaranayake are in the children’s section of the Library where a motley crew of animals from a colourful mural are our rapt audience as we discuss its workings. Sixty years old, the American Center Library on Galle Road, near Galle Face, has a collection of 4,000- 5,000 books and is intended to provide access to American resources. With access to 40 online databases, the library is in the process of adding more to its digital and physical collection. Says Sunera, “We’re trying to keep a balance between physical books which people still love and also accommodating the reality that a lot of things are going digital and that people need access to resources which are not in hard copy.” Padma equates their virtual library to a literary supermarket (“everything is there, for all age categories”) and highlights that specific journals or papers unavailable on their existing databases can be obtained through their inter-library resources with the Washington Library. The library offers facilities for people to improve their English through Dyned, a teaching software available free for library members. Students can also use the TOEFL, SAT and GRE guides and American university guides in the library. The American Centers extensive facilities as well as the intimacy of its setting are offered at a nominal fee for members. It’s also a space to simply hang out – members can play a board game in a corner or study and activities such as film screenings, book club meetings, panel discussions, lectures and virtual speaker events are regular fixtures. The library also serves as an informal gallery with new exhibits every few months. Looking for last December’s Hi!!! Magazine or a palm leaf manuscript in Pali? The National Library on Independence Avenue, Colombo 7 would be your best stop. Walking into the National Library and Documentation Centre, you are struck by the vast and colourful mural of the country’s flora and fauna. 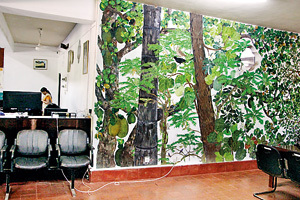 Painted by teachers and students of various schools, it spans three floors. Started in 1990, the National Library serves as the country’s apex library and main reference library and is home to a collection of more than half a million publications, though as Librarian Anoma Wijeyesinghe laments, so few people know of its vast repository of resources. Given its size and historical collection, the library functions as a reference library and not a lending one. 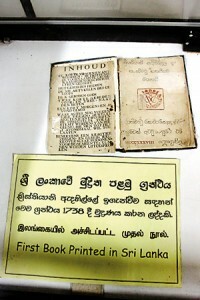 As we navigate the labyrinth of books, there in a glass case is the first book printed in Sri Lanka. Pointing to an employee engrossed in scanning a thick, faded leather-bound book, Anoma explains that steps have been taken to digitize parts of the library and to start a National Digital Library. The library has an archive of English, Sinhala and Tamil newspapers published in Sri Lanka from 1976 to date as well as a collection of over 800 periodicals and theses by Sri Lankan PhD and M.Phil students. 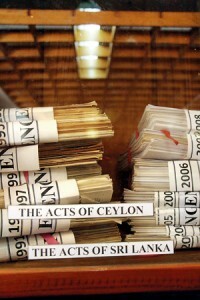 The Sri Lanka collection consists of every single book published in Sri Lanka and foreign publications on Sri Lanka. The National Library also houses special collections acquired by the library. The Martin Wickramasinghe collection, for example, is a thoughtful presentation that seeks to capture the essence of the writer by exhibiting his study (complete with his typewriter, assorted memorabilia and armchair), library and draft manuscripts covered in Wickramasinghe’s sprawling handwriting. The Government Publications collection comprises yellowing Government Gazettes, Acts, Bills, Commission reports and circulars while large, archaic encyclopedias are also available for anyone wishing to do reference work. A rare book collection, an ola leaf collection (a large collection of palm leaf manuscripts and rare books can also be found in the Museum Library), folklore collection and a map collection consisting of over 1000 maps are also archived within the library. Celebrating its 25th year, the National Library has many activities planned. Director General of the National Library, W. Sunil explains that they will host an international conference with the participation of National Libraries from the South Asian region. Locally, the library has taken steps to develop and improve nine selected libraries around the island. Plans are also underway to start a library call-centre, where callers can easily access any information about the library resources, and a regional conservation centre.